Valery Gergiev enters the hall at London’s Barbican, leaps on to the podium, shakes the hand of the orchestra’s leader and bows to the musicians, hand on heart. One would now expect the lights to dim and for Gergiev to dive into his performance. But this is no concert; rather, it’s a rehearsal at 11am of a programme Gergiev and the London Symphony Orchestra have played innumerable times. Wearing a blue shirt hanging loose, he slings his jacket over the podium railings, flicks a forelock from his brow and rests back on a stool. “Good morning,” he grins. Gergiev is the greatest conductor of his generation. Even those who disagree concede that he is the most electrifying. His high profile internationally is based on his spellbinding effect on audiences and musicians alike – not to mention his famous performance of Shostakovich’s Leningrad symphony to an audience of Russian soldiers and tank commanders amid the ruins of the capital of his homeland, Tskhinvali in South Ossetia, after fighting between Russian and Georgian troops. In Russia, Gergiev is an emblem of nationhood as well as cultural prowess. Within days of this rehearsal, Gergiev will take 24 hours out between performances with the LSO in Europe to perform in Moscow to 250,000 people on Russia’s national day. But Gergiev is also a jewel in Britain’s crown; since the start of 2007, he has been principal conductor of the London Symphony Orchestra. Born in 1953 and raised in North Ossetia, Gergiev went to his adoptive home, Leningrad, to study at the conservatoire in 1972. Already, he had been steeped in the performances of the conductors he cites when he explains his own way of working. Asked what on earth is going on at his concerts, he says: “It’s easier for me to explain what I felt when I was a student while I was able to listen to some of the great recordings of the past,” citing especially Toscanini and Wilhelm Fürtwangler in big Romantic repertoire. So many batons have flown from Gergiev’s hand into audiences and orchestras over the years that he now conducts with a toothpick, or with an inimitable flutter of the fingers. The way he communicates with his musicians in rehearsal is both direct and poetic, decisive and democratic. “I am a musician, as they are too. We are equals, but I am at the centre,” he says. The closer the piece gets to its conclusion, the more Gergiev immerses himself, beads of sweat forming on his brow, although the seats are empty; this is no spectacle, this is music making. Next is Stravinsky’s Symphony in Three Movements, written the same year as the dances, but how different: here is a terrifying piece of wartime music, but that of an exile in the United States watching his native Russia being overrun by the Nazis. Gergiev is forever citing and invoking his heroes, Evgeny Mravinsky and Fürtwangler. And yet both these men were notoriously tyrannical; Gergiev’s menace is different. “In a way,” says Rachel Gough, principal bassoonist, “the most frightening thing of all is to be trusted to get it right on the night. He throws us in and expects us to rise to the challenge. That is how he gets the very best out of us. We are the kind of orchestra that responds to that; for us as for him, it is all about the performance”. Next day, the orchestra departs for a tour of eastern Europe while in London the Royal Philharmonic Society awards the maestro a prize for being the year’s outstanding conductor. Gergiev accepts by video-link and six hours later, at 5am next morning, the boxed silver statuette of Orpheus’s lyre is on the scanner at Heathrow, in hand baggage carried by the LSO’s managing director, Kathryn McDowell. Gergiev assembles the orchestra in the wooden-panelled, red velvet-seated, communist-era hall in Vilnius. After dealing with calls on his mobile phones, he worries about the acoustics. Briefly accepting the Royal Philharmonic award from McDowell and disposing of it, he turns to the matter in hand: rearrangement of the musicians’ seating – “Everyone forward two metres, please” – so as to project that much more forcefully. The opening piece will be a world premiere by Gergiev’s Russian friend Rodion Shchedrin entitled “Lithuanian Saga”. Shchedrin is up-front about exactly how he wants his music played, hardly deferential towards the guest orchestra, and Gergiev accordingly becomes markedly more bossy with the musicians in the presence of an esteemed fellow Russian. Tonight’s audience arrives like a 60s fashion parade, all silver suits and lace ruffs, drinking brightly coloured fruit cocktails. Vilnius in Lithuania, once a part of the USSR, now a country antipathetic towards Russia, gets ready to greet a Russian superstar. Here, there is no British fussing about fire regulations that might prevent those who have not found a seat from standing in the aisles and up the stairwells. And Gergiev turns up the volume to maximum, so that Stravinsky is a whirlwind flying around the inhospitable acoustics and Rachmaninov is amplified to almost Mahlerian levels. 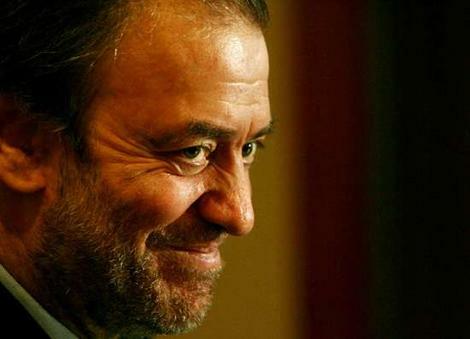 Gergiev, unshaven, his tails more crinkled than usual, looks at once exhausted and possessed. Then he relaxes entirely, back home in a way – or nearly – with friends running the Vilnius festival, chatting in Russian about music, sport and mutual acquaintances at a reception – Gergiev at ease, social Gergiev. On the charter plane to Tallinn, Baltic port capital of Estonia, Gergiev, sitting by a window, talks about football and Shostakovich. “I hear it is a very small hall we are playing in tonight. We shall see what can be done. He gives an enigmatic, mischievous grimace. Then he falls into silence and stares out across the flat land, the forests and meadows, north-east towards St Petersburg. “Tomorrow, I will see my wife and children, at last,” he sighs. “One of the things many people assume about Gergiev is that he is interested in self-gratification and being famous,” says Bradshaw, “and some great conductors I’ve worked with are. Now that Leonard Bernstein is dead, I can say that he was interested in fame, because he was. But not Gergiev. Yes, he wants to be influential, he wants a role in public life, so he can get things done that he is interested in, like the new concert hall in St Petersburg. But not to be famous for its own sake. Adulation does nothing for him – in fact, it’s the last thing that interests him. “Gergiev really believes that he can do something that has never been done before and that faith is contagious, it transfers to the orchestra. He is a totally committed performer and this is crucial to what we do with him. Every orchestra has its special sound, its way of doing things. The Austro-German tradition of conducting is that you prepare in rehearsal exactly what you will do in the concert and there are some great orchestras and conductors that work like that, and give terrific concerts. When Gergiev played the Leningrad symphony – a sacred anthem in Russian history about withstanding siege by the Nazis – in South Ossetia, opinion in the west was either confused or appalled that Gergiev should make so bold a statement apparently in support of the then President Putin and in defiance of Georgia, whose crushing of the South Ossetian secessionist movement the west broadly supported. Gergiev has repeatedly said he was proud of what he did as a Russian, and would do it again. And why should this come as such a surprise? This the man who played a concert for peace in Omagh cathedral after the bombing and gave another similar performance in the infamous Ossetian town of Beslan, after hundreds of schoolchildren were killed by Chechen terrorists. “I am an Ossetian first and foremost,” Gergiev once said of the forests and mountains to which he retreats when his schedule permits. Perhaps we in the west want our Russians neatly packaged and easily explained in a way that reality does not allow. Shostakovich has to be either a great dissident or a party toady; there is no room in the western mindset for him to be both. Similarly, Gergiev has , in western eyes, to be either the wild, rock star genius who remoulded the old, staid Soviet Kirov opera into the new Mariinsky for capitalist consumption, or else Putin’s puppet who plays in front of Russian tanks. Any consideration of a great Russian artist must understand, or at least acknowledge, the multilayered existence they live in a country where the call of Mother Russia is deep, where art and politics have always been entwined under any system, be it a tsarist monarchy, communist dictatorship or contemporary democracy. The fact is that two plus two does not necessarily equal four in Russia. With his constant citing of Shostakovich, Mravinsky and Fürtwangler, Gergiev feels a much closer bond to the epic tribulations of the 20th century than his peers, such as Simon Rattle or Claudio Abbado. It is sometimes – when he plays not only Russian music, but that by Mahler or, this season in London, Dutilleux, who knew Ravel – as though Gergiev carries the weight of the 20th century and these events on his shoulders. Born Valery Abisalovich Gergiev in Moscow, 1953. Brought up in North Ossetia alongside two sisters. When Valery is 14, his father dies of a heart attack. Begins piano at secondary school and, aged 19, joins the conducting course at the Leningrad Conservatory. 1976 Wins the All-Soviet Conducting Prize. 1978 Makes his debut with the Kirov Opera. 1981 Appointed chief conductor of the Armenian Philharmonic Orchestra. 1988 London debut with the London Symphony Orchestra. 1996 Chosen by the Russian government to be the Mariinsky Theatre’s artistic director. 1999 Marries Natalya Debisova. They have three children. 2005 Appointed principal conductor at the London Symphony Orchestra. 2008 Conducts a concert paying tribute to South Ossetian war victims outside the region’s ruined parliamentary building. They say: “Gergiev doesn’t know what it is to hold back. No matter how hard he pushes others, he pushes himself further.” Brian Large, classical music film and TV director.